LOS ANGELES (Reuters) - Starbucks Corp wants more people to use its time-saving mobile ordering app that lets customers buy drinks without waiting in line. Interviews with more than two dozen Starbucks customers suggest that the move, aimed at countering robust competition from fast-food chains and other coffee sellers, may face obstacles. To start, saving time was not high on some customers' wish lists. In fact, several said they deliberately slow down their Starbucks visits to indulge in mini catch-up sessions with the "baristas" who take orders and make lattes. Such comments highlight Starbucks' cultural conundrum: How can the company meet the demands of tech-savvy, time-crunched customers as well as growth-hungry investors without turning into a commodity fast-food chain? "I don't mind standing in line. I like to chat with the baristas," said Los Angeles business consultant John Mishler, 30, who began using Starbucks' mobile order app shortly after it launched nationally in September 2015. He visits a Starbucks virtually every day, but only uses the service roughly once every three weeks. "I have an excuse to be doing nothing," Mishler said, referring to his wait in line. "It's part of my morning routine and I don't want to change it." "If my life is so complicated that I can't wait 5 minutes for a cup of coffee, I have to realign my priorities," said San Francisco Bay Area marketing consultant Diane Schreiber, 49. Kevin Johnson, who succeeded Starbucks' co-founder Howard Schultz as chief executive in April last year, told shareholders on Wednesday that Starbucks can satisfy both rushing customers and those who prefer to take it easy. "Some in the industry believe that you must either focus on a retail experience that is about community or a retail experience that is about convenience, you cannot do both," he said at the company's annual meeting in Seattle. "We do not buy into the false trade off." Shortly after launching the mobile-ordering service, Starbucks suffered a fiasco - bottlenecks at locations where baristas were not prepared for the crush of orders. Baristas worked through the issues, and by the end of 2017 mobile orders accounted for 11 percent of Starbucks' U.S. transactions. Now, the company wants to offer mobile orderings, previously available only to members of its loyalty program, to all customers. Its journey is instructive for other restaurants, including McDonald's Corp and Dunkin' Donuts , which followed Starbucks into mobile ordering. Such services might help companies save money by automating tasks. On the other hand, some customers say they can put spending on autopilot - a potentially expensive proposition when Starbucks medium "grande" lattes cost around $5 each. Molly Harper, 26, stopped using Starbucks mobile order after it became a burden on her wallet. "Your money runs out pretty fast," said Harper, a Los Angeles restaurant server and self-described coffee lover. She was spending about $40 a week on mobile order and has cut way back since dropping it. All of the customers interviewed by Reuters appreciated the appeal of faster service, and some prefer it. Alex Vorro, 37, who works in downtown Chicago, is satisfied with mobile ordering - except when beverages take significantly longer than the app estimates or he gets the wrong drink because of a mix-up with someone with the same name. Washington, D.C., economist Preston Motes, 49, visits Starbucks weekly, pays with its app but doesn't use mobile order because he finds it "irritating." His beef? 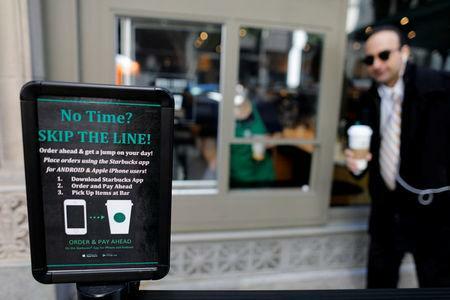 Mobile orders go into the queue as soon as they are placed, allowing users to skip ahead of the people who are waiting in line. "I'm always wondering why my drink takes longer when there's no one in line and it's because of the mobile orders," Motes said. That is not lost on Robert Street, 33, a former Starbucks barista who is still in the habit of watching customers. Street sends his mobile order to Starbucks through Amazon.com Inc's Alexa every morning as he is leaving for work at a private high school in Houston. Breezing past the line in the store to grab his beverage waiting on the counter, "I selfishly feel like I won the system and saved a bunch of time," Street said. Then, he notices the people in line. "I always feel like a criminal," said Street, who admits that he still feels like he is pilfering a drink he already paid for. He's heard waiting customers ask baristas what he is doing and wants them to know that he is not Instagram's @thisisnotmycoffee - a "Bandit" who rates stolen Starbucks mobile order drinks. When reached by Reuters, @thisisnotmycoffee declined comment.